Receive the card by email. Looking to do an experiment? Document it before hand with all the necessary parameters in check. How should I use the experiment card? Gather your ideas with the Experimentation Card. Turn your assumption into a hypothesis. A hypothesis is an educated guess for what you expect to happen in a given experiment. A hypothesis must be measurable: "“If we do X, then Y% of target audience will behave in way Z." What are your metrics? Your hypothesis is testable. For example: "A blogpost will drive over 100 signups." It is repeatable and measurable. There are no failed experiments. Only unexpected outcomes. Conclude new results out of your experiment after execution. The Growth Revolution added a new dimension to our online experimentation process. We were able to get fast, concrete results in days that would otherwise take weeks. Set up your own experiments with the Experiment Card. Learn which tactics are valuable for your business. If you are looking to do an experiment, you must set up its rules beforehand. Create a measurable, risky hypothesis. This will determine if a hypothesis is validated or not. 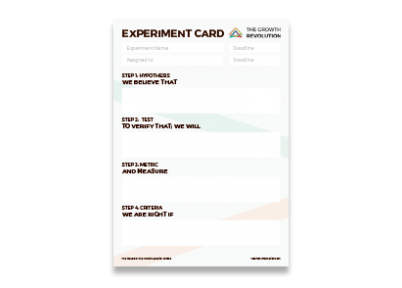 Gather your ideas with the Experiment Card.